Landscape plants that are heat-beaters are difficult to find. Some are just too prim to withstand the hot summers of late. What equation should we use in determining the best for the situation? Check your garden after an especially long, hot summer to see what not only survived, but also has potential to be the backbone of your sizzling summer landscape. I scouted my garden, after 100 plus degree heat, looking for these workhorses that plug away, even under the most trying conditions. There are shrubs that survive the heat, and even seem to welcome it. I wilted every time I stepped out, but these garden gems stay fresh. Granted, I did irrigate during this heat wave, but there are some other unhappy plants that didn't fare so well, even with water. There are two exceptional landscape heat-beaters. The first defeaters are abelias. Back in their glory years, abelias were overused and abused. Public landscapes that got low-or-no-care became their planting beds, giving them the nickname "gas station plants." I have never stuck up my nose at a common plant. There is good reason favorites return to the garden line-up year after year and generation after generation. They look good under dreadful conditions. They endure heat and neglect. There are days, sometimes weeks, when we have to abandon the garden. Our disappearance, no matter how temporary, can be deadly to a team of rookies. I have the old "gas station" abelias established in my landscape. They have fresh, shiny green foliage, ready for the fall post-season garden rebirth. They bloom on new growth, so in late winter I cut them back, and they reward me with spouts of white flowers on bobbing stems. They are not just for gas stations any more. A new abelia has moved in. Abelia Silver Anniversary(TM) is pleasing in a pot along with a deep red starflower and a yellow blossoming melampodium. The silver and green foliage that arise from red stems trumps the abelia blooms. Who needs flowers when the foliage is so attractive? This abelia's new foliage is almost cream, a soft yellow that surges above cherry pink stems. As this abelia matures, the leaves become somewhat mottled green and cream with a red tinge on the ends. The prime foliage is aged into creamy soft silver with splash-painted green centers. The whole plant is a watercolor vision Monet would appreciate. Silver Anniversary(TM) is a survivor. This summer, five straight days of above 100 degrees Fahrenheit has given it a trial by fire. It passes the test-non-wilting color in a heat wave. What's more, these switch hitters perform equally well in the sun or shade landscape. 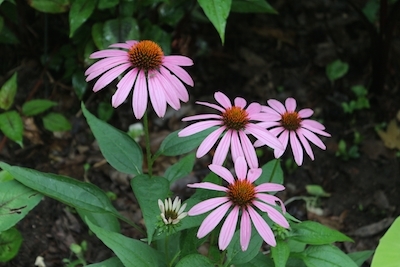 The second staunch performers are the perennial coneflowers. 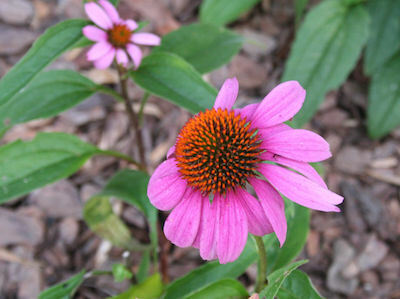 These summer stars, the Echinacea genus, can take over more of your garden. 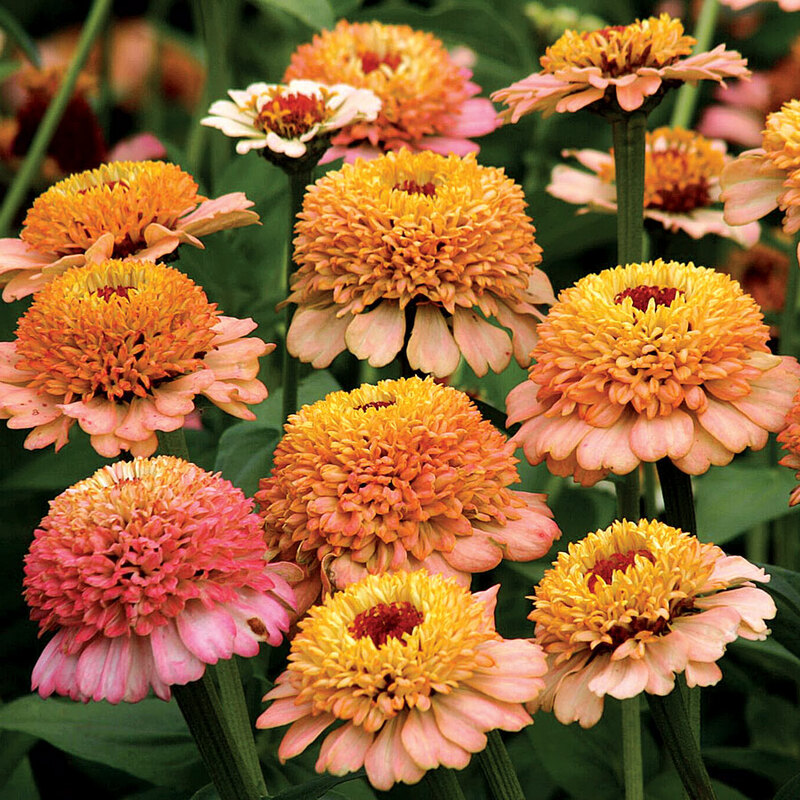 By late summer, they cover themselves with a team of daisy-like flowers with beefed up centers. These raised cone centers are the axis for the pink flower petals. The pink petals supply the landing and launching pads for the visiting butterflies and bees. I know in my heart that I should cut the stalks of coneflowers so that a fresh squad will come along, but every time I approach them, bumblebees and butterflies are happily visiting them. I go cut something else, something not so important to my buggy friends. These lovelies must contain nectar and pollen until the very end of summer, when their cones are dry and the petals are paled and falling. I can't cut them then, either. The seeds, held high on the coned stem ends, are bird buffets. There are so many different colors and shapes to the coneflowers now, and as an obsessed gardener, I want them all. I believe that if I had room, I could do a whole border in coneflowers. (Then I would have to give up some other love.) There are the pinks (called purple, but varying shades of pink to my eye) with every imaginable set of petal rays- up, down, flat, curved, fat, or skinny. The, pink 'Magnus' has wide, stocky petals. He is as full as a pink sunflower with large flowers that show off from a distance. On the opposite side of the field, 'Lilliput' is loaded with small rosy flowers made up of two rows of petals. This miniature also shows off, just with the sheer numbers of flowers covering the plant. There are some break-through colors for these once wildflowers, too. White (Fragrant Angel(TM)) and yellow (Harvest Moon(TM)). A favorite of mine, and one that will make your heart go pitty-pat, is Summer Sky(TM). To show it off best, locate it in your landscape with green companions, in part shade if you are in a section of the country prone to brutal sunlight, near a path where its blended colors of pink, coral, orange, and golden yellow can be admired up close. The blossoms are huge. The intermingled colors invite contemplation. Even the stalwart black-eyed-Susans are looking a little tattered and worn right now. They will need some fluffing up. Some old pros will need replacing, which is not a problem, but an opportunity to try new plants, hmm...perhaps that new gaura, 'Crimson Butterflies?' What has survived in your landscape? Expand the team this fall.